Well! It’s been another hiatus. There was a weekend spent without power thanks to the derecho that came through a couple of weeks ago. And then another weekend (last weekend) I was in North Carolina visiting friends. In between, there was my birthday, a cold, and two seasons of Downton Abbey. I hope to return to regular posting, especially now that I have a new laptop. My seven-year old ponderous desktop has been almost as much of a hindrance to my blogging participation as my former commute. I have been reading steadily this summer though. There are a couple of books that will get the full review treatment (including Connie Willis’ Doomsday Book) but here is a collection of mini-reviews to start. 2008. St. Martin’s Press. Hardcover. 292 pages. From: picked this up from The Book Thing of Baltimore. Review: This is the third book in Deutermann’s Cam Richter thriller series. I reviewed the first two here. Former cop Richter now runs a private investigation business. 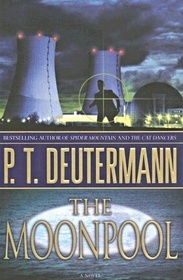 When one of his PI team members dies from exposure to radiation, Richter is led to look at a nuclear power plant in Wilmington, N.C to figure out what happened to her. As per usual in this series, Richter gets on the wrong side of the law because he won’t back off the case (this time with a Homeland Security twist). Also, as usual with the series, Richter ends up at one point trapped with a nasty critter (first book it was a mountain lion). And finally, per usual, Richter’s two German Shepherds – Frick and Frack – end up being the Most Valuable Players of the action and of the story. I don’t read many macho thrillers and I seriously suspect this series won that slot in my reading attention because of those dogs. It’s not even that I’m a dog lover, but I get a thrill every time the dogs end up being a game-changer in the action. Also, while Cam Richter has work partners and a special lady friend, the true emotional core of the book is his relationship with his dogs as the ending makes clear. I read The Moonpool in the week before my move and with its pages packed with action and peril, it was the right book for the time. I think there is at least one more book in the series which I plan to get to at some point. 1985. Fawcett Juniper. Paperback. 288 pages. Review: So I had just moved into my new apartment and realized that I didn’t have a book on hand to read (I’d already finished The Moonpool). My brain went “Need. Book. Now.” So I sliced opened the nearest box that said “Books” in it and selected Jackaroo from the contents. I’ve had the book since I was eleven or twelve, but I hadn’t re-read it in a long time. Jackaroo is set in a time and place that is vaguely medieval, with rigid division between the classes and a hard life for all but the nobility. Gwyn, the Innkeeper’s Daughter, is the pragmatic and capable teenage protagonist who hates the injustice she sees around her. When Gwyn saves the life of a Lord’s twelve-year-old son during a blizzard, the repercussions of that action change how she views her world, her family, and the legend of Jackaroo, a Robin Hood type character she had always thought to be make-believe. Jackaroo stood up well on my re-read. I loved the character of Gwyn when I was twelve and she’s still a character I admired. She’s flinty and principled. What I like even better about her is that her heroine status is not something that comes from her possession of a special ability. While trained to defend herself with a staff, she has little experience with weaponry or even horse-riding. Her greatest strength is her political savvy – she is illiterate but she knows how her world works, and so she can strategize based on that. She doesn’t have big dreams of changing the world, but what she can do she feels she must do even if it risks her life. In the end, she accomplishes good in her community but at significant personal cost. I don’t read a lot of young-adult novels, but enough of them to think that this 1980’s YA novel feels refreshing somehow. I’m not sure why. 2007. Penguin. Paperbook. 429 pages. Review: I’ve been meaning to read this book for ages, ever since I kept seeing it everywhere. In case you haven’t heard of this book, here’s the premise: a child is murdered in a Dublin suburb and this murder may be connected to a missing child case from twenty years ago. At first I loved reading this book. The writing was superb. French uses her descriptive powers judiciously. The partnership relationship between Detectives Rob Ryan and Cassie Maddox was intriguing and felt really fleshed-out. I was a very impressed reader for about 200 or so pages. I’m not sure what exactly happened that turned me off the book. I’m not a reader who reads the end first, but it’s not uncommon for me to peek ahead into later chapters if I’m anxious about something. 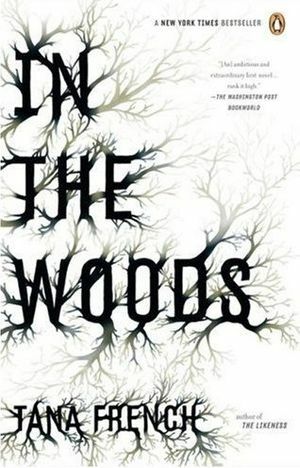 For In the Woods, I was made anxious by Ryan’s narration (the book is written in first-person from Detective Ryan’s perspective.) He kept dropping alarming hints of future catastrophe and finally I caved in and flipped forward. And what I found just really put me off finishing the book. It may not be an objective reason for disliking a book, but I just didn’t like where it went plot-wise. I saw a Goodreads review of this book by someone named Karen and she quoted a friend’s reaction who had said “I liked it until I didn’t.” And basically that’s the way it was with me and In The Woods. I properly read only 250 pages of it and don’t plan on reading the rest of it or any other book in the series. But I can see why some readers would love it. 2011. Harper Perennial. Paperback. 220 pages. So this was an overall pleasant little read, but I suspect a forgettable one. The appeal is in the style. 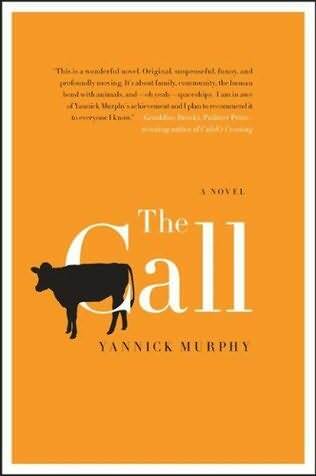 The first-person narrator is a large-animal vet in Vermont whose life is disrupted by his son’s serious injury in a hunting accident. He tells the story in a series of concise reports. Especially at the beginning, the reports start with The Call, that is whatever veterinary calamity summons the doctor, followed by the Action, which is what the vet does for the animal, and then the Result, which is self-explanatory. However, the narration applies this reporting style to all aspects of the vet’s life. The story really is more about his family life than about his job, though his job continues to be an important throughline of the narrative. WHAT THE CHILDREN SAID TO MET WHEN I GOT HOME: Pop, you smell like manure, and what’s that on your upper arm? WHAT I SAID: Why, that’s horse saliva. WHAT THE WIFE COOKED FOR DINNER: Pizza. WHAT KEPT ME AWAKE AT NIGHT: Pizza. As I hope the above excerpt shows, the style was very conducive to “brevity is the soul of wit” moments. And yet, sometimes the narrator had trains of thought that I did not follow or didn’t find interesting; there were these random observations that I think are meant to be profound or quietly beautiful but just did nothing for me. So, I’m not sorry that I read the book because the novelty of the style was engaging and doesn’t wear out its welcome, thanks to the short length of the book. But it didn’t have a whole bunch to offer beyond the style, in my opinion.